AMD chose a rather interesting day to launch Vishera, the Piledriver-based desktop FX CPU, as Apple also has a press event today. We think the timing of the two tech events is purely a coincidence since AMD scheduled the release date long before Apple sent out its invitation. Unlike Apple, which is trying to steal some thunder away from the imminent launch of Windows 8, AMD wants to ride along with the new OS release and hope that it can help to boost its CPU sales as people will be shopping for a new system/CPU to go with the new OS. Compared to Zambezi (Bulldozer FX CPU), Vishera is more like a refresh than a new launch. The Trinity APU that we reviewed a couple of weeks ago features a greater architectural change in both the CPU and the GPU. 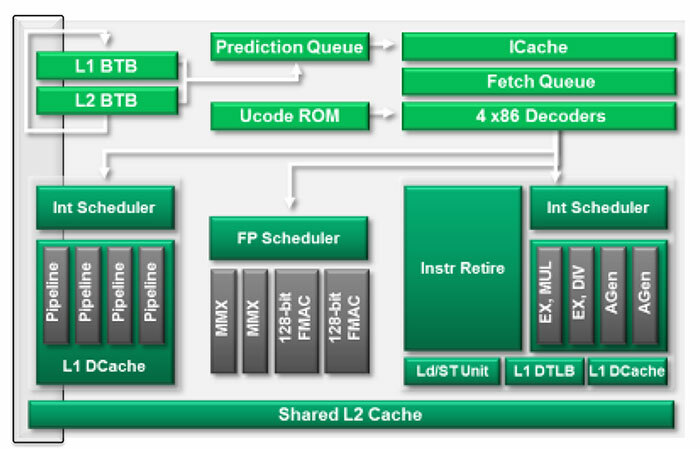 However, with Vishera we get a minor tweak of the CPU architecture (Piledriver) in conjunction with a higher clockspeed. This is not a bad thing because Piledriver has improved upon some of the weakness that Bulldozer showed. This, coupled with a higher operating clockspeed, means the Vishera CPU should offer some good performance enhancement over Zambezi. Major microarchitectural change is always a challenge in the in the PC industry. Something that looks great on paper may not always translate into real-world performance. Part of problem is that while the hardware maybe capable of doing great work, software that can really take advantage of that potential may not exist in the mass market. AMD’s Bulldozer suffered due to the lack of proper software support. Many desktop applications like games are simply not threaded heavily enough to fully take advantage of the eight integer cores. Bulldozer suffered a bit of split personality: it excelled in the heavily threaded tasks like video transcoding, 3D Modeling, and data encryption, but at the same time it failed in the lightly threaded tasks. Unfortunately for AMD, waiting for the software manufacturers to catch up is impractical: it could take a long time for software makers to release updates to fully utilize all of Bulldozer’s cores. Such a delay would be costly, especially since Intel already has better performance with the existing software. Thus, AMD has to fix what is not working properly on Bulldozer and find a way to improve its performance. What we get as a result is Piledriver. By now, we’re sure most of you already heard about Piledriver, the enhanced Bulldozer. Piledriver has improved many of Bulldozer’s weakness. Inside the Vishera is the same Piledriver module that is found on the mobile and desktop APU that we reviewed. It is still built based on the same 32nm SOI with 1.2 billion transistors on 315 mm2 die area. Like Buldozer, Piledriver has the same module design with two integer units plus one float unit unit share other resources. While “Piledriver” is still based on the same architecture and module design of Bulldozer, it has improved significantly over Bulldozer. 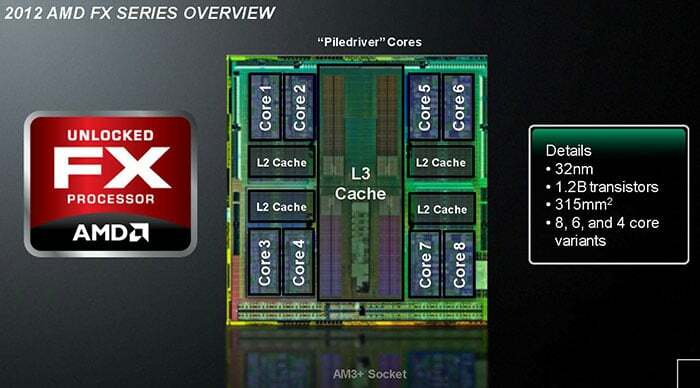 The picture above shows what improvement and enhancements AMD has done on Piledriver. 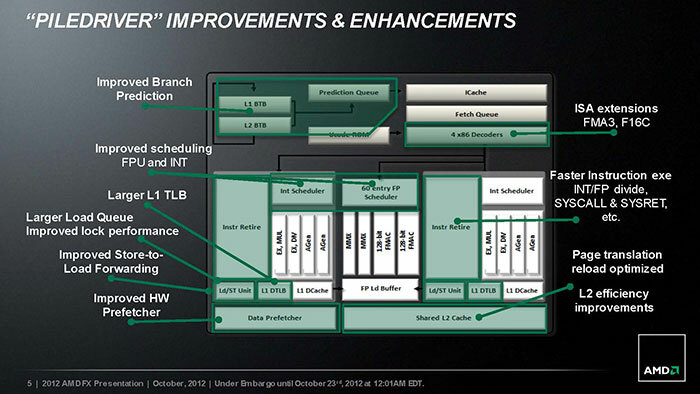 AMD has improved on the branch prediction, scheduling, and the hardware pre-fetcher. Together, these will help Piledriver to improve on its instructions per clock. By keeping it more streamlined, Piledriver offers approximately a 10 to 15% improvement over Bulldozer. As you may recall, one of the problems with Bulldozer is that its single-threaded performance was not only slower compared to Sandy Bridge but also is slower than AMD’s outgoing K10.5 Phenom II CPUs. As a result, in lightly threaded applications, Bulldozer is simply slower than AMD’s older CPU despite its better multi-thread performance. The enhancement that AMD has done with the Piledriver and the higher operational clockspeed should help AMD to deliver at least the same single-thread performance as its older CPU. The memory controller has not been changed on Vishera: it still supports DDR3-1866 speeds. The controller supports DDR3 up to 64GB. 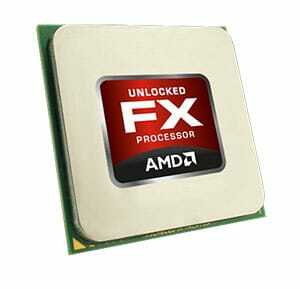 In addition to the performance enhancement, AMD also adds two new ISA instruction sets: FMA3 and F16C. Bulldozer already supported FMA4 and with the addition to the FMA3, Piledriver is first CPU with such support as Intel won’t add FMA3 until Haswell.